Today would have been President Reagan’s 100th birthday…or “Dutch” Reagan as he was known back in his radio days with WOC in Davenport and WHO in Des Moines. I remember when President Reagan was in Davenport around 1987-88 to address the Chamber of Commerce. It was $1000 donation to the RNC to get your “photo opp” with the Gipper, needless to say it was a little beyond my budget and I had to pass on the photo. My wife & I had the opportunity to visit Reagan’s Presidential Library a few years ago. 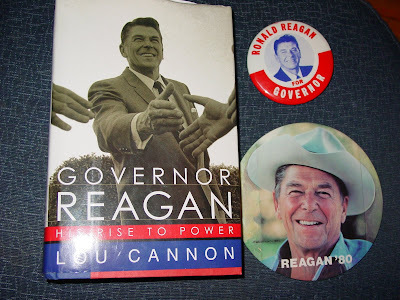 I’ve visited several presidential libraries in my travels, and RR’s is at the top of the list. I’ve read numerous books about Reagan and my favorite is Lou Cannon’s “Governor Reagan”, which deals with his pre-presidential career. Reagan was elected governor of California in 1966 upsetting incumbent Pat Brown(Jerry’s dad). A lot of people don’t realize that Dutch ran for the GOP presidential nomination in 1968 and 1976, and won on his third try (1980). In 1968 Reagan had the highest number of delegates going into the Republican Convention and lost to fellow Californian Richard Nixon. In 1976 he challenged a sitting Republican president(Gerald Ford) and lost a razor thin race for the nomination.